6 How much Percent of body weight must be used? Lumbar traction is the process of applying a stretching force to the lumbar vertebrae through body weight, weights, and/or pulleys to distract individual joints of the lumbar spine. The word traction is a derivative of the Latin word "tractico", which means "a process of drawing or pulling, and various forms of spinal traction have been described, since the time of Hippocrates, for the relief of pain. 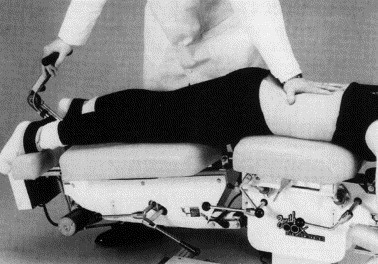 James Cyriax popularized lumbar traction during the 1950s and 1960s as a treatment for disc protrusions, and until today, it is still a common modality for treating patients with back pain and leg pain. The effectiveness has been questioned by a few clinical trials and recent guidelines published by NICE in the UK, KCE in Belgium, the Danish Health Authority and the American College of Physician's no longer endorses traction as a therapy modality in the treatment of low back pain. James Cyriax describes three benefits of lumbar traction: distraction to increase the intervertebral space, tensing of the posterior longitudinal vertebral ligament to exert centripetal force at the back of the joint and suction to draw the disc protrusion towards the center of the joint. Some other effects attributed to traction include widening of the intervertebral foramen and distraction of the apophyseal joints. The lumbar spine is made up of five individual vertebrae which are numbered L1 to L5 and together they create the concave lumbar curvature in the lower back. Found along the body’s midline in the lumbar (lower back) region, the lumbar vertebrae make up the region of the spine inferior to the thoracic vertebrae in the thorax and superior to the sacrum and coccyx in the pelvis.These vertebrae carry all of the upper body’s weight while providing flexibility and movement to the trunk region. They also protect the delicate spinal cord and nerves within their vertebral canal. Connecting each vertebra to its neighboring vertebra is an intervertebral disk made of tough fibrocartilage with a jelly-like center. The outer layer of the intervertebral disk, the annulus fibrosus, holds the vertebrae together and provides strength and flexibility to the back during movement. The jelly-like nucleus pulposus acts as a shock absorber to resist the strain and pressure exerted on the lower back. The lumbar vertebrae are the some of the largest and heaviest vertebrae in the spine, second in size only to the sacrum. A cylinder of bone known as the vertebral body makes up the majority of the lumbar vertebrae’s mass and bears most of the body’s weight. Posteriorly the body is connected to a thin ring of bone known as the arch. 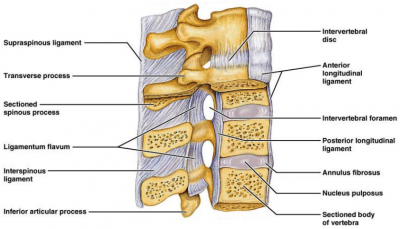 The arch surrounds the hollow vertebral foramen and connects the body to the bony processes on the posterior of the vertebra. The vertebral foramen is a large, triangular opening in the center of the vertebra that provides space for the spinal cord, cauda equina, and meninges as they pass through the lower back. Extending from the vertebral arch are several bony processes that are involved in muscle attachment and movement of the lower back. The spinous process extends from the posterior end of the arch as a thin rectangle of bone. It serves as a connection point for the muscles of the back and pelvis, such as the psoas major and interspinales. 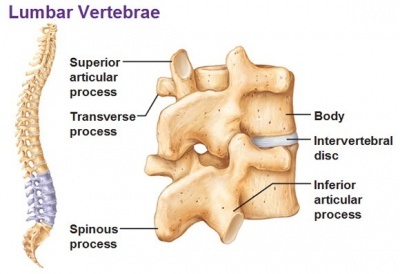 On the left and right lateral sides of each vertebra are the short, triangular transverse processes. The transverse processes form important connection points for many muscles, including the rotatores and multifidus muscles that extend and rotate the trunk. Unlike the cervical vertebrae in the neck, the lumbar vertebrae lack the transverse foramina in the transverse processes, and also lack facets to either side of the body. The fifth lumbar vertebra is distinct from the L1-4 vertebrae in being much larger on its front side than in the back. Its spinous process, on the other hand, is smaller than in the other lumbar vertebrae with a wide, four-sided shape that comes to a rough edge and a thick notch. Continuous or bed traction uses low weights for extended periods of time (up to several hours at a time). This long duration requires that only small amounts of weight be used. It is generally believed that this type of traction is ineffective in actually separating the spinal structures. In other words, the patient cannot tolerate weights great enough to cause separation of the vertebrae for that length of time. This type of traction involves heavier weights applied steadily for short periods of time (for periods from a few minutes up to 1 hr). Sustained traction is sometimes referred to as static traction. Manual traction is applied as the clinician's hands and/or a belt are used to pull on the patient's legs. It is usually applied for a few seconds duration or can be applied as a sudden, quick thrust. This involves using a chest harness to secure the patient as the treatment table is tilted to a vertical position, thereby using the weight of the lower half of the body to provide a traction force. Several theories have been proposed to explain the possible clinical benefit of traction therapy. Distracting the motion segment is thought to change the position of the nucleus pulposus relative to the posterior annulus fibrosus   or change the disc-nerve interface . These effects are plausible based on studies examining the kinematics of the lumbar spine during traction therapies. In addition to separating the vertebrae, traction has been shown to reduce nucleus pulposus pressure  and increase foraminal area . However, it is unlikely that mechanical changes observed in a prone position will be sustained after a patient resumes an upright, weight bearing posture. Any lasting clinical response to traction therapy would more likely be because of the effect of traction on the mechanobiology of the motion segment or neural tissues. Complicating the issue further is that not all traction therapies exert the same force on the spine and animal studies have found the mechanobiology of the disc to be sensitive to the amount, frequency, and duration of loading . It is possible that some forms of traction stimulate disc or joint repair whereas others promote tissue degradation . Although these variables have not been systematically examined, even in animal models, what is known regarding disc mechanobiology should alert us to the possibility that not all traction therapies are equal. If distracting the spine can influence disc and joint mechanobiology, different modes of traction may result in different clinical results. Systematic reviews of lumbar traction therapy have typically not considered that different effects may exist based on force and time parameters . Traction trials have most often included patients with a mix of clinical presentations including back-dominant low back pain (LBP), leg-dominant LBP, or both. However, a patient with only dominant LBP and no radiculopathy is likely experiencing pain from a sclerotomal source, such as facet joints or disc, whereas sciatic pain, even if caused by disc herniation, may be predominately of neural origin. Although it is reasonable to suspect that traction therapies may affect these conditions differently, there is insufficient evidence to support this hypothesis. Summary evidence in recent systematic reviews and clinical practice guidelines concludes that mechanical lumbar traction is not effective for treating acute or chronic nonspecific low back pain (LBP); however, many physical therapists continue to use it, primarily as an additional modality. Indeed, expert clinical opinion, theoretical models, and some research evidence suggest that certain patients with LBP respond positively to traction. A study published by Thackeray et al. (2016) concluded that there is no evidence that mechanical lumbar traction in combination with an extension-oriented treatment is superior to extension-oriented exercises alone in the management of patients with lumbar nerve root compression. Herniated lumbar disks are the central cause of sciatica. Cohort studies suggest that the condition of many patients with a herniated lumbar disk improves in 6 weeks. In other words a conservative therapy is generally recommended for 6 weeks in the absence of a major neurologic deficit. There is no proof that conservative treatments change the natural history but some offer slight relief of symptoms. A meta-analysis of 32 randomized trials showed no significant benefit of lumbar traction. Several studies have investigated the effect of lumbar traction on lumbar disc herniation. Autotraction does not change the location and size of an herniation but there is a marked clinical improvement in the patients. According to Ljunggren et al., autotraction and manual traction are equally efficient, in both treatments the pain intensity was significantly reduced. Mechanical lumbar traction as additional therapy to extension exercises facilitates the patient’s improvement in pain and return to prior level of function. After 5 weeks patients no longer experience low back pain and improved in terms of functional status and pain-related disability. Lumbar traction in combination with a physical therapy program also gives a decrease in the size of herniated disc material. Unlike the previous studies, Rattanatharn et al. showed no benefit of traction (together with routine conservative treatment) for patients with acute herniated disc syndrome. Either alone or in combination with other treatments, traction has little or no impact on pain intensity, functional status, global improvement and return to work among people with low back pain. There is no improvement in functional status, pain, range of motion and work absence due to lumbar traction (compared with sham traction). Also the addition of intermittent mechanical traction to a standard graded activity program gives no extra advantage for people with low back pain. There is no difference in outcome of the graded activity program with or without the lumbar traction. Borman et al. had the same effect in their study: no specific effect of traction in standard physical therapy for low back pain was observed. Although previous conclusions give no benefit to lumbar traction for low back pain. searched prediction rules for those patients who have an improvement. The presence of non-involvement of manual work, low level fear-avoidance beliefs, no neurological deficit and age above 30 years increase the probability of response to mechanical lumbar traction. How much Percent of body weight must be used? What amount of force is required to exert an effect on the lumbar spine. From a systematic review six studies compared traction with sham traction (table 6). 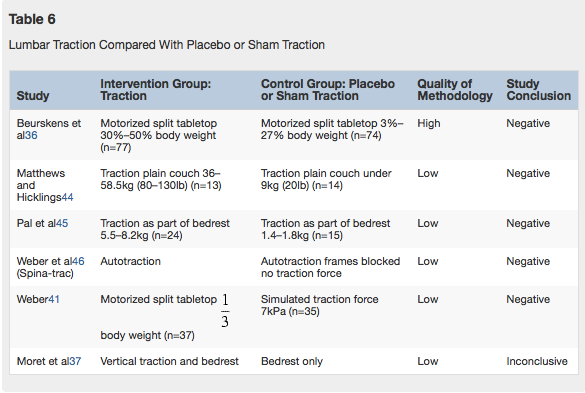 Sham traction is a low-weight or placebo traction that the given researcher considers to be ineffective. Three studies used motorized traction (2 on a split tabletop, 1 on a plain tabletop)), 1 used autotraction, 1 used gravitational traction, and 1 used traction as part of bedrest. Only the study by Beurskens et al was of a high quality, and all gave negative results except for the inconclusive result of Moret et al. The Roland-Morris Disability Questionnaire (RMDQ) is designed to assess self-rated physical disability caused by low back pain. Numerical pain rating scale (NPRS): on a box scale from 0–10 describing ‘usual level of pain in the last week’. This presentation, created by Leigh Langerwerf as part of the Evidence in Motion Fellowship, discusses the current best evidence for lumbar traction. ↑ Wegner I, Widyahening IS, van Tulder MW, Blomberg SE, de Vet HC, Brønfort G, Bouter LM, van der Heijden GJ. Traction for low-back pain with or without sciatica. . Cochrane Database Systemic Reviews, 2013; 8:CD003010. doi: 10.1002/14651858.CD003010. ↑ Clarke JA, van Tulder MW, Blomberg SE, de Vet HC, van der Heijden GJ, Bronfort G, Bouter LM.Traction for low-back pain with or without sciatica. Cochrane Database Systemic Reviews, 2007; 2:CD003010. ↑ Schimmel JJ, de Kleuver M, Horsting PP, Spruit M, Jacobs WC, van Limbeek J. No effect of traction in patients with low back pain: a single centre, single blind, randomized controlled trial of Intervertebral Differential Dynamics Therapy. European Spine Journal, 2009; 18(12):1843-50. doi: 10.1007/s00586-009-1044-3. ↑ Stochkendahl MJ, Kjaer P, Hartvigsen J, et al. National Clinical Guidelines for non-surgical treatment of patients with recent onset low back pain or lumbar radiculopathy. Eur Spine J 2018; 27: 60-75. ↑ Qaseem A, Wilt TJ, McLean RM, et al. Noninvasive treatments for acute, subacute, and chronic low back pain: a clinical practice guideline from the American College of Physicians. Ann Intern Med 2017; 166: 514-530.